Gentleman Cthulhu is a humourous web-comic by writer and artist J. M. DeSantis. It is told in the traditional three-panel format and publishes on gentlemancthulhu.com. The comic combines DeSantis’s often bizarre sense of humour with his love for the work of H. P. Lovecraft, Gothic horror, Victorian literature and monsters. It also draws inspiration from the work of Mike Mignola (one of DeSantis’s influences). The character, Gentleman Cthulhu, is from an illustration J. M. DeSantis created in 2011. 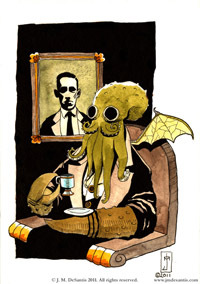 The illustration, Cthulhu Taking Tea, was in turn based on an unused cover concept he meant to submit to Planet Lovecraft Magazine (which closed its doors in 2009). The piece proved popular as a print and eventually ended upon the cover of Innsmouth Magazine: Collected Issues 5 – 7 (2012, Innsmouth Free Press). Still, despite the piece’s small successes, J. M. always felt there was more he could do with the character. When his Chadhiyana series was picked up by Rosarium Publishing, DeSantis still wanted to do a web-comic; however, he needed something that would not take time away from his commitment to Chadhiyana and other creative projects. It was then he remembered his Victorian Cthulhu character and developed a simple formula, through which he could play and experiment with minimalist storytelling, and hopefully generate a few laughs. The first Gentleman Cthulhu comic, The Unnameable (not to be confused with the Lovecraft story of the same name), was published on Thursday, August 20, 2015—what would have been H. P. Lovecraft’s 125th birthday. It has continued to publish weekly ever since. J. M. DeSantis (born Jeffrey Michael DeSantis) is a writer and artist. He is the creator of the medieval Indian fantasy heroine, Chadhiyana (chadhyiana.com), and is the author of a number of short stories and artworks, mostly in the fantasy, horror and humour genres. His first graphic novel, Chadhiyana: In the Company of Shadows, is currently publishing as a bi-monthly comic from Rosarium Publishing. He is also the writer and artist for the weekly web-comic, Gentleman Cthulhu (gentlemancthulhu.com). Learn more about J. M. and his work on his website, jmdesantis.com, where he also keeps a regular blog.